Frank Carey led North Reading to a state title in 2012. Frank Carey never dreamed he'd have such a successful career. 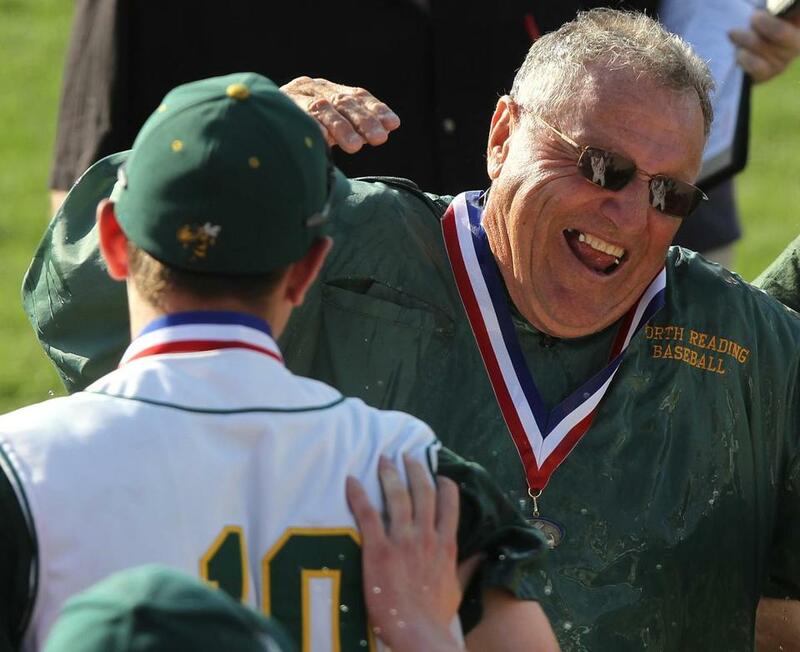 When he started as the head coach of North Reading’s baseball team 47 years ago, he wasn’t sure what the future would hold. It turns out the future has been pretty bright. Carey, on Thursday afternoon, became the state’s all-time winningest baseball coach after the host Hornets swept a doubleheader against Newburyport. The two victories gave Carey 726 for his career (all at North Reading), which surpassed former Leominster coach Emile Johnson. One is senior Scott Allen, who got the win in both games. The first game, a 9-2 Hornets win, started in the 10th inning, a continuation of the first game of the season. The Hornets batted first and scored seven runs in the top of the 10th, with Allen driving in the winning run with a single. He then closed things out in the bottom of the innnig. North Reading (10-3) won the second game, 3-2, with Allen (6-1) striking out five and allowing six hits in a complete game. With a few weeks to go in the season, Carey would not say if he would be back to add to his win total next year. Lynn Classical 6, Somerville 0 — Freshman Herbie Newton hurled a complete game shutout, striking out four and allowing just three hits to lead the host Rams (7-6). Masconomet 4, Swampscott 1 — Junior left fielder Greg Dougherty blasted two home runs and drove in three runs to help lead the No. 5-seeded Chieftains (13-0). Pentucket 5, Saugus 0 — Senior Ryan Kuchar threw six scoreless innings, striking out eight for the Sachems (9-4). East Bridgewater 10, Hull 4 — Senior Mike Kelly (5-0) struck out six and allowed five hits. Cohasset 14, Norwell 9 — Senior outfielder Tommy O’Brien was 4 for 4 with three RBIs for the Skippers (8-6). Senior Mickey Barry also had three RBIs. Framingham 8, Natick 4 — Senior third baseman Pat Carroll finished with three hits, including two doubles, to lead the Flyers (6-8). Medford 6, Reading 5 — Senior Connor McGovern hit three triples the Mustangs’ win. Taunton 9, Franklin 1 — Sophomore Luke Figueira struck out seven in a complete game for the Tigers. Holbrook 7, Avon 3 — Senior Dylan Edes went the distance, allowing five hits and striking out five to lead the Bulldogs (11-2). Junior right fielder Brandon Walker drilled a two-run homer in the third inning and freshman center fielder Seamus Galgay added three RBIs. Marian 5, Cathedral 1 — Nick Tiselli went 4 for 4 with three runs scored for the Mustangs. Lynnfield 9, Manchester Essex 2 — Senior pitcher Andy Carbone allowed one run in a complete game for the Pioneers. Bedford 5, Acton-Boxborough 1 — Joey Zampell had the complete game for the Buccaneers. Stoughton 6, King Philip 5 — Sam Werman drove in Jovani Perez on a walk-off single for the Black Knights. Southeastern 4, Bishop Connolly 1 — James Cullen struck out eight and allowed one run in the Hawks’ win. Holliston 15, Dover-Sherborn 0 — Junior Mike Daleaz struck out seven for the Panthers. Junior Anthony Cordani went 3 for 5 and senior Mike Sancomb went 2 for 4. Silver Lake 3, Quincy 2 — Junior Adam Gay pitched four strong innings and had four strikeouts and sophomore Jason Johndrow earned the save for the Lakers (13-3, 9-2) after recording two strikeouts in 1⅓ innings. Milton 8, Wayland 3 — Senior Collin McCabe tallied two hits, two RBIs and also pitched a complete game for the Wildcats. Greater Lowell 6, Northeast 5 — Senior Nik Powers (4 for 4, three RBIs) knocked in the winning run with a single in the bottom of the seventh. Hopkinton 15, Medfield 3 — Seniors Chris Moberg and Nick Will each finished with four hits, a solo home run and three RBIs to power the Hillers (7-5). Hanover 5, Scituate 3 — Senior Matt Sointu allowed one earned run on six hits for the Indians. Douglas 16, Advanced Math and Science 6 — Nolan Karsok was 4 for 5, Matt Peladeau had a double, triple and four RBIs, and Eddie Peladeau went 3 for 5 with a two-run homer to spark the visiting Tigers (7-7). Billy Helenius was 2 for 3 with a double and drove in three runs for the Eagles (7-4). Sutton 15, Abby Kelley Foster 0 — Tyler Girouard, Evan Curloss and Nick Spain each went 2 for 3 and combined for five doubles and six RBIs as the host Sammies (9-5) rolled in five innings and closed to within a win of a postseason berth. Cameron Halloran had the only hit for the Bears (3-8). Holy Name 13, Southbridge 1 — Chris Piascik (3 for 5), Joey Fitton (two doubles) and Josh Riley (2 for 4) had multiple hits as the No. 5 Naps (10-5) won in Southbridge and qualified for their sixth postseason in the last seven years. Emilio Torres doubled and scored for the Pioneers (2-11). Algonquin 16, Quabbin 5 — Jack Henningson went 4 for 5 with four RBIs, and Mike Baker added three hits, including a double as the fourth-ranked Tomahawks (10-3) qualified for the postseason. Ryan Walsh was 3 for 4 for the host Panthers (5-5), and teammate Kyle Judd added two hits, including a two-run triple in the fifth inning. St. John’s (Shrewsbury) 8, Burncoat 4 — Charlie Murray struck out 13 over five scoreless innings and gave up two hits, while Kevin Quinlivan had two hits, including a double, and drove in two runs to lead the No. 2 Pioneers (11-3) in Shrewsbury. Sophomores Jake Rosen (2 hits) and Sam Shaw doubled and drove in three runs for St. John’s. Matt Howard homered and doubled, while Matt Morse doubled for the Patriots (5-9). Bartlett 9, David Prouty 8 — Anthony Grzembski was 3 for 4 and scored three runs and James Patterson was 2 for 4 with a double and a triple and drove in three runs as the visiting Indians (5-10, 5-7 SWCL) took a 9-3 lead in the third and held on for the win. The Panthers (9-4, 8-3) scored five runs in the sixth to cut the lead to one and had the tying run on second base with two outs in the seventh, but Evan Anderson gunned him down at third to end the game. Anthony Higbie and Cody Morio each had two hits for Bartlett. Rob Dukes was 2 for 4 with two stolen bases and Tyler Golden was 3 for 4 for David Prouty. Shrewsbury 11, St. Peter-Marian 5 — Jack Quinlivan had a two-run homer and drove in four RBIs, while Jeff Svendsen was sharp on the mound as the No. 6 Colonials upended the No. 1 Guardians in Shrewsbury. St. Peter-Marian scored four of its five runs via the longball, as Nate Frederick had a three-run shot and Jack Riley belted a solo shot. North Middlesex 4, Tyngsborough 0 — Righthander David Neuhaus lost his no-hit bid with one out in the seventh inning, settling for a one-hit shutout with 16 strikeouts and no walks, and Shawn Pinney (3 for 4) provided the winning runs with a two-run double in the sixth inning as the visiting Patriots (7-4) beat the Tigers (4-6). Richard Sharp was 2 for 3 with a RBI single in the seventh as North Middlesex tacked on two runs. Andy Savard broke up the no-hitter with a single through the left side of the infield. Oxford 5, Millbury 3 — Sophomore Jared Buckley hit a two-run homer to left field in the top of the eighth inning to lift the No. 10 Pirates (14-2, 11-1 SWCL) over the host Woolies (8-6, 7-6) and deny coach Ron Silvestri his 500th victory. James Sheehan (2 for 3, 2 RBIs) led off the eighth with a double. Buckley was 2 for 4 with 3 RBIs). Ryan Ward was 2 for 3 with a double, RBI and run for Millbury. Littleton 5, Narragansett 2 — Alex McLaughlin and Travis Bassett combined on a two-hitter and gave up no earned runs, and Dylan Rzezuski had a two-run single during a three-run sixth inning that snapped a 2-2 tie as the host Tigers (10-0) beat the Warriors (7-4). Worcester Tech 9, Bay Path 4 — Senor Doug Barbon went 3 for 4 with a run and RBI, senor Colin Fitzgerald was 2 for 3 with two runs, and junior Al Caruso went 2 for 4 with an RBI for the visiting Eagles (8-4, 6-2 CAL). For the Minutemen (7-5, 4-4), junior Will Shedd and sophomore Tucker Hetherman each had two hits and scored a run. Shepherd Hill 6, Tantasqua 3 — Cam Scotia had three hits and went the distance,striking out 11, while Cody Murphy had a three-run homer to spark a a 6-run first inning to lead the host Rams (8-6, 7-4 SWCL). Shepherd HIll’s Brady Ravenelle had two hits, including a double, with an RBI. Zac Edwards was 2 for 3 with an RBI double for Tantasqua (3-10, 1-8). North Brookfield 15, St. Mary’s (Worcester) 1 — Jeremy Glinski allowed one run on three hits, while striking out 11 as the host Indians (3-4, 3-3 Worcester County) won Game 1 of a doubleheader with the Eagles. Zach Rudzinski and Brandon Molleur (2 for 3) both scored two runs in the the opener. Kyle Lareau and Tom Beaupre both hit grand slams in the nightcap, with Lareau’s highlighting a five-run first and Beaupre’s a five-run third. Alex Orsi was 2 for 2 with a double and three runs, while Dylan Dupre allowed just a third-inning single to Zack El-Dahr in five strong innings. El-Dahr had three of St. Mary’s four hits, going 2 for 3 in Game 1. Worcester Academy 206, Cushing 231 — Noah Altamarina shot 3-over 39 at Gardiner Municipal GC while lifting the visiting Hilltoppers (9-3) over the Penguins (0-5). Bridgewater-Raynham 15, Dartmouth 7 — Gavin Perry scored four goals for the No. 11 Trojans. Framingham 9, Walpole 3 — Senior Jake Cotton had three goals and an assist and junior Jimmy Chin added three goals to lead the Flyers (9-5). Marian 21, Cardinal Spellman 8 — Sophomore attack Ralph Grillone recorded six goals and one assist to lead the Mustangs (3-12). Catholic Memorial 10, BC High 8 — Brothers Kevin and Curt Bletzer both had two goals and an assist for the Knights (9-5). Ipswich 14, Methuen 6 — Jamie Iwanicki had 16 saves for the Tigers. Central Catholic 15, Tewksbury 8 — Alex Parent had five goals for the Raiders (9-5). Algonquin 6, Grafton 2 — Zach Skowronek scored three goals to lift the visiting Tomahawks (9-5). Goalie Colton King, Matt McEvoy and Nick Polutchko had the other Algonquin goals. Chase Kapuscunski and Matt O’Brien tallied for the Indians (10-5). Groton-Dunstable 11, North Middlesex 5 — Nick Irby had three goals, and Austin Hourani (2 assists) and Zach Cotoni (1 assist) scored twice for the host Crusaders (6-6). Groton-Dunstable’s Ryan Dodge had three assists. Corey DaSilva scored two goals for the Patriots (5-8). Wachusett 5, Shrewsbury 4 — Sophomore Michael Fritschy came around the offensive left side and buried a shot from seven yards out 2:20 into overtime to give the visiting Mountaineers (8-8, 2-7 Midland A) a win over the Colonials (12-2, 8-1). Chris Ritter made 16 saves for Wachusett, while Chris Gorman made 15 saves for Shrewsbury. Westborough 12, Nashoba 5 — Junior Jake Foster scored four goals, while senior Mike Gallo and junior Jack Pierce had two goals each and combined for three assists to spark the host Rangers (9-2, 7-2 Midland A)) past the Chieftains (6-8, 2-6). Leominster 13, Hudson 9 — Andrew Bouchard scored three goals and added two assists and Hector Delgado rammed in two goals to lead the visiting Blue Devils (10-3, 8-1 Midland B) to their fifth straight win. Sophomore attack Adam Cariveaux paced the Hawks (5-6, 5-4) with five goals and one assist, while Jon McDonald chipped in with a pair of goals. Tyngsborough 18, Bromfield 2 — Ben Foley had five goals and five assists, while Kyle Laforge had four goals and an assist to help the visiting Tigers (9-4, 7-2) top the Trojans (2-9, 2-6). Kyle Butler had three goals and three assists, while Austin Coene had three goals and two assists for Tyngsboro. Northbridge 9, Hopedale 1 — Sophomore Jaden Bauman had three goals and four assists, while freshman Matt Deluca added a hat trick to lead the visiting Rams (6-7, 3-5 MMLL). Trevor Wilson scored for the Blue Raiders (3-10, 0-9). Doherty 6, Tantasqua 5 — James Bowler scored his third goal of the game late in overtime to win it for the visiting Worcester (11-0, 9-0 Mid-Mass.). Junior Trevor Robert scored late in the fourth quarter to tie it for Tantasqua (7-7, 5-4). Goalies Sean Moran of Worcester and Jared Mesick of Tantasqua both played excellent games. Nabeel Tokatli had two goals for the Wildcats, while Brandon Haghigi scored twice for the Warriors. Blackstone Valley 14, Greater New Bedford 2 — Senior attack Bailey Leacy scored eight goals and senior keeper Griffin Boyle made 10 saves as the host Beavers (8-4) swamped the Blue Devils (6-7). Revere 3, Salem 2 — Third singles Freshman Mathew Lopez won in straight sets (6-0, 6-0) to lead the Patriots (1-6). Arlington Catholic 5, Matignon 0 — Junior Kenny Pham recorded 18 aces for the Cougars (6-4), who swept a doubleheader. Andover 3, Wellesley 2 — Senior captain Barun Penamatsa’s victory (6-2, 4-6, 6-2) at second singles clinched the match for the Golden Warriors (10-0). Cohasset 5, Norwell 0 — Miles Marin won the first singles match for the Skippers, 6-0, 6-0. Whitinsville Christian 5, Blackstone-Millville 0 — Owen Brickhouse d. Danny Manning, 6-2, 6-4. Ben Koopman d. Shane Carey, 6-0, 6-1. Jacob Chapman d. Andy Lussier, 6-1, 6-0. Josh Cook-Gabe Brickhouse d. Tyler Brabham-Alex Hemphill, 6-4, 6-1. Michael Dunlap-Spencer Gordon d. Jack Quiteau-Tyler Kent, 6-3, 7-5. Records: WC 7-3 (4-1 Dual Valley), BMR 4-6 (0-5). Hopedale 4, Burncoat 1 — Matt Costanza (H) d. John Kraemer, 7-5, 6-2; Ethan Luong (B) d. Jon Nayes, 6-1, 6-4; Jake Murray (H) d. Corey Daley, 6-0, 6-1; Mitch Siefring-Jon Rajcula (H) d. Nathan Luong-Kevin Nguyen, 6-2, 6-0; Jagath Jai-Kumar-Wes Rodrigues (H) d. Chris Tisdell-Dan Brizuela, 6-0, 6-0. Records: B 5-6, H 8-3. Quabbin 3, Fitchburg 2 — Erich Steiner (F) d. Anthony Pellegrino, 6-1, 6-0; Spencer O’Reily (Q) d. Jack Lanni, 6-1, 6-0; Jack Peterson (Q) d. Keanu Bouthsarath, 6-1, 6-2; James Webber-Troy Bieshka (Q) d. Cameron DeVescovi-Jouan Vang, 7-5, 6-1; Fitchburg wins by default. Records: Q 1-11 (1-6 Midland B), F 1-12 (0-9). Shrewsbury 5, Nashoba 0 — Austin Delasse d. Christian Fletcher, 6-0, 6-0. Pat Tusinski d. Andrew Bilodeau, 6-0, 6-0. Ethan Wei d. Tom Kennon, 6-4, 6-0. Sam Liang-Dom Tusinski d. Nathan Campbell-Sean Quirk, 6-2, 6-3. Gokul Ajith-Danny Kiely d. Brenden McMullen-Caleb Winick, 6-1, 6-2. Records: S 11-4, N 4-6. West Boylston 4, St. Peter-Marian 1 — Jack Baily (WB) d. Carmine Bai, 6-0, 6-4; Victor Green (WB) d. Maxwell Yang, 7-6 (10-8), 6-1; Rob McGrath (WB) won via default; Joe Swalec-Diego Javier (WB) d. Simon Ra-Sam Liu, 6-2, 4-6, 6-1; Minwoo Kim-Steve Yea (SPM) d. Andrew Fraser-Mike Jameson, 6-1, 6-4. Records: SP< 1-7, WB 7-2. Quaboag 5, Leicester 0 — Raphael Gundersen d. Matt Kilmonis 6-2, 6-2; Brady Antonopolous d. Nick Markie 6-0, 6-0; Travis Nichols d. Jay Hamm 6-0, 6-0; Herrick Spencer-Magnus Martin d. Blake McNamara-Cullen Mars 6-0, 6-0; Connor McCaffrey-Rob Greenlaw d. Casey Green-Jason Reynolds 6-1, 6-2. Records: Q 10-2 (9-0 SWCL), L 2-12 (1-11). Needham 3, St. John’s (Shrewsbury) 2 — Wes Arnold (SJ) d. Sam Cohen, 6-0, 6-3. Alex Cohen (N) d. Mitch Axelson, 6-0, 6-1. Ian Levy (N) d. Mehdi Haider, 6-4, 6-3. Jon Dupre-Nick Hallal (SJ) d. Josh Simon-Jacob Shuman, 2-6, 6-2, 6-4. Jake Davidson-Andrew Bejian (N) d. Ray Mehtani-Mahi Shapally, 6-3, 6-1. Records: N 6-3, SJ 5-8. Tyngsborough 4, Littleton 1 — Antoine Clement (L) d. Nick Yang, 6-4, 6-1; Dan Magee (T) d. Allie Stea, 6-1, 6-0; Dan McDonald (T) d. Hansen Holland, 6-3, 7-5; Parth Patel-Paul Schinget (T) d. Joanna Farrell-Sujith Naapa Ramesh, 6-0, 6-1; Zack Gray-Cam Pasao (T) d. Richard Ryzi-Danielle Conceison, 6-3, 7-5. Records: T 5-2 (3-2 Wachusett C), L 2-4 (1-3). Tantasqua 3, Shepherd Hill 2 — Curt Allen (T) d. Benjamin Hoke, 6-2, 6-1; Kurt Bilis (SH) d. Tim Eineberg, 7-5, 3-6, 6-2; Christopher Merrill (SH) d. Eric Ying, 7-5, 1-6, 6-2; Max DeCataldo-Ben Kennedy (T) d. Michael Rapoza-Benjamin White, 6-4, 6-3; Mike Damon-Aaron Inthirath (T) d. Jacob Blanchard-Christopher Lindstrom, 4-6, 6-3, 6-1. Records: T 8-1 (7-1 SWCL), SH 6-5 (6-4). Worcester South 4, Uxbridge 1 — Deno Alkurdi (S) d. Kyle Semle, 6-0, 6-0; David Stone (S) d. Luke Higgins, 6-3, 6-2; Dany Alkurdi (S) d. Devin Travaline, 6-0, 6-0; Quyen Tran-Travis Tran (S) d. Cam Sullivan-Jacob Irving, 6-2, 6-2; Thomas Travaline-Tim Cotter (U) d. Thomas Let-Alex Chan, 6-2, 6-1. Records: U 1-11, S 6-4. Chelsea 72, Greater Lawrence 64 — Junior Adriel Rodriguez won the shot put and came in second in the 200- and 300-meters to lead the Red Devils (5-1). Clinton 83, Gardner 62 — Ed Quill won the shot put and discus, and Eugene Gamael took the long jump and triple jump to spark the visiting Gaels (3-2). Jonah Kattau captured the high jump, high hurdles and 200 for the Wildcats (1-4-1), and teammate Seth Viles won the 800 and mile. Lunenburg 98, Bromfield 47 — Jake DeGrace won the shot put (42-2-1/4), 110 hurdles (15.6) and the 100 (11.9) and Jon Hudson won the triple jump (36-3), 200 (25.3) and the 400 (56.6) to lead the visiting Blue Knights (3-2, 2-2 Wachusett C) past the Trojans (1-4-1, 1-3-1). Monty Tech 69, Blackstone Valley 67 — The visiting Bulldogs won the 4x400-meter relay to take the meet in Upton. Phil Burch prevailed in the 400 and high jump for the Beavers (2-3). Worcester Tech 112, Keefe Tech 24 — Juniors Mark Bastien and Jovaughn Brown both set personal bests in finishing 1-2 in the javelin as the host Eagles (8-0, 5-0 CAL) crushed the Broncos (0-2, 0-2). Barnstable 3, Medfield 0 — The Red Raiders (9-5) qualified for the state tournament behind 14 kills each from Scott Sawyer and Donny Mach. Lexington 3, Billerica 0 — Junior Justin Kim had 20 assists and two blocks for the Minutemen (11-3). Needham 3, Wellesley 1 — Junior middle hitter Skylar Kaufman had 21 kills to power the second ranked Rockets (16-0). Douglas 3, Worcester North 0 — Senior Danny Zidelis had 13 kills and four blocks while sophomore Mitch Thackaberry added 20 assists and five kills for the host Tigers (8-6), who battled to a 26-24, 25-19, 25-23 victory. Kevin Adjei had six kills and Andrew Sasaki added four kills and nine assists for the Polar Bears (6-8). Wachusett 3, Marlborough 0 — Brad Durkin paced a balanced attack for the host Mountaineers (12-3, 8-2 Mid-Wach), recording seven kills and four blocks in a 25-16, 25-16, 25-11 victory over the Panthers (5-10, 5-5). Monty Tech 3, Worcester Tech 0 — Patrick Morse had 2 aces, 6 kills and 4 blocks, while Jesse Cormier had 6 kills and 4 blocks to lead the visiting Bulldogs (14-2, 9-0 Colonial) past the Eagles (9-5, 7-3) by set scores of 25-19, 25-19 and 25-10. Adrelll Enlow had 4 kills, 3 blocks and 4 digs for Monty Tech. Matignon 15, St. Joseph’s Prep 0 — Senior Jocelyn Theher tossed a one-hitter for the Warriors (5-10). Cardinal Spellman 11, Whitman-Hanson 3 — Senior Courtney Zambello hurled seven innings, striking out 11 and allowing no earned runs for the Cardinals (12-2). Abington 14, Monomoy 0 — Juniors Amanda Doherty and Jackie Sloan both had RBI doubles for the Green Wave (9-5). Taunton 7, Franklin 2 — Senior Jesse Aleixo allowed only three hits to lead the Tigers. Bishop Fenwick 5, Austin Prep 3 — Senior second baseman Jen Crovo went 4 for 4 with two runs to help the visiting Crusaders (8-5). Silver Lake 12, Quincy 1 — Shannon Grindle went 2 for 3 with a three-run home run for the Lakers. Framingham 8, Natick 6 — Taylor Hogan went 3 for 3 with a triple and three runs scored. East Boston 16, Madison Park 3 — Senior Stephanie Rizzo struck out four in a complete game for the Jets. Waltham 10, Gloucester 0 — Kayla Walazek only allowed two hits in the Hawks’ win. Arlington Catholic 4, St. Mary’s 1 — Freshman Emily Arredondo struck out 10 and allowed two hits in seven innings for the Cougars. Winthrop 5, Lynn Classical 1 — Vikings catcher Jenna Adamson went 1 for 3 with a triple, an RBI, a run scored and she threw out a runner attempting to steal. Thayer 18, Milton Academy 3 — Senior center fielder Chaislyn Burgio went 3 for 4 with a home run and four RBIs for the Tigers (5-4). Carver 13, Mashpee 1 — Amy Ellis had three hits and four RBIs for the visiting Crusaders (6-4). East Bridgewater 15, Hull 0 — Sophomore pitcher Jenna Talabach struck out 10 in a one-hitter for the Vikings. She also had three RBIs. Hanover 23, Scituate 11 — Sophomore Kayla McMahon had five hits to lead the Indians (9-3). Douglas 7, Advanced Math and Science 4 — Anelia Marston hit a three-run double and struck out nine, and Hannah Furno was 2 for 4 with three RBIs to lift the visiting Tigers (8-6). Jess Urella hit a grand slam in the seventh for the Eagles (6-3), and teammate Emma Forte went 2 for 3 with a run. Notre Dame (Worcester) 10, Hopedale 2 — Luccia Feraco had a single, two doubles and drove in four runs, while Molly Terry added two singles, a double and Gaby Montoya doubled twice to boost the host Rebels (6-8). Nicole Apicella singled twice and tripled, while Leah Siefring had two hits for the No. 8 Blue Raiders (8-3). Sutton 10, Abby Kelley Foster 0 — Junior Madison Milaszewski hurled a five-hit shutout with 11 strikeouts and only one walk, and also went 2 for 3 with two RBIs and scored twice to power the host Suzies (6-3). Junior Maddie Keigwin went 3 for 5 with a three-run double and two runs. For the Bears (4-8), Andrea Prue had two singles in three at-bats. David Prouty 14, Bartlett 2 — Taylor Houston hit a three-run triple and Miranda Daab had a two-run triple as the host Panthers (10-4, 8-3 SWCL) qualified for their first postseason in five years with a five-inning victory. Winning pitcher Abby LaFountain went 3 for 3. Danielle Stone singled and Elena Gatchell had an RBI double for the Indians (1-14, 1-11). Millbury 2, Oxford 0 — Eighth-grader Gabby Hunt scattered six hits and knocked in the winning run for the host Woolies (7-8, 4-6 SWCL). Ashley Hamilton, Mikaela Mitchell and Hunt had consecutive singles in the third inning, and Angie DiDomenica’s bunt squeezed home Mitchell with the second run. Millbury’s Maria DiDomenica went 3 for 3, as did Gabby Cardenas for the Pirates (8-7, 7-5). Shepherd Hill 9, Tantasqua 0 — Senior Emily Reynolds and sophomore Amanda Lane each went 2 for 3 with three RBIs and two runs and senior southpaw Brenna Foley threw a two-hitter as the visiting Rams (8-3, 7-3 SWCL) beat the Warriors (5-9, 4-7). Uxbridge 18, Worcester South 4 — Sam Wise was 3 for 3 with three RBIs, and leadoff hitter Missy Morton was 3 for 4 with an RBI to lead the host Spartans (8-6). Sarah Vanasse had a three-run homer for the Colonels. Athol 14, St. Bernard’s 2 — Jess Soucie and Lexi Hamley each had three hits to lead the visiting Red Raiders. Ryley Wilkie had three hits and drove in two runs for the Bernardians (3-9). Algonquin 6, Quabbin 2 — Kristen DeVries went 4 for 4 with a double, triple, RBI and run scored, Vicki Elliot went 2 for 2 with two runs, and Allie Courtwright scattered five hits and struck out 10 for the No. 7 Tomahawks. For the host Panthers (5-8), Samantha Priest went 2 for 3 with a double and run and Jillian Schlegel was 2 for 4. Tyngsborough 11, North Middlesex 1 — Brooke Bogacz had a two-run single in the first to lift the host Tigers (8-3). Emily Rapoza homered for the Patriots (1-8). Shrewsbury 10, Chelmsford 2 — Kara Brown (double, 3 RBIs, 3 runs) and Amber Melidio (double, 2 runs) each went 2 for 5 while lifting the No. 9 Colonials (8-5) over the host Lions (11-2). Oakmont 14, Monty Tech 5 — Paige Toothacher was 3 for 5 with a double and three RBIs, Kallie Napolitano added two hits and Hayley Maciel had a three-run homer to boost the visiting Spartans (7-2). Taylor Bacigalupo had two hits and drove in two runs, Brandi Richard had an RBI single and scored twice and Kanessa Champney had an RBI single for the Bulldogs (6-6). Holy Name 3, Danvers 0 — The visiting Naps rallied in the sixth when Heather Drummond led off with a double and scored on Danielle Rocheleau’s single. Lauren Merritt followed with a single, which set up a two-run double from Deanna DiPilato to give No. 2 Holy Name some breathing room. Kelsey Saucier struck out 10 for the Naps (12-1). Kendal Meehan had two hits for the Falcons (7-3). Clinton 14, Burncoat 2 — Allyson Holfinger (RBI) and Lindsey Beary (double, 3 RBIs) each had three hits, and Hannah Fleming was 2 for 3 and drove in four runs as the host Gaels (7-4) rolled in six innings. Bridget McGrail went 2 for 3 with a double for the Patriots (4-9). Worcester Tech 11, Bay Path 2 — Freshman Gianna Sasso was 3 for 3 with a triple and two RBIs, while Kali Shamally was 2 for 3 to lead the visiting Eagles (7-5, 5-4 Colonial). Pauline Muise was 2 for 3 with an RBI for the Minutemen (4-6, 3-5). Blackstone Valley 15, Parker Charter 3 — Hannah Clark rapped a two-run homer, and Olivia Bouchard (2 RBIs, 2 runs) and Rachel Arnold (double, triple, 4 RBIs) each added two hits as the visiting Beavers (8-3, 8-1 Colonial Athletic) won in six innings. Brynn Massarelli tripled and Aleksa Thomas singled for the Bears (3-9, 1-8). Notre Dame (Worcester) 48, Groton-Dunstable 6 — Lauren Fantaroni carded 5-over 41 at Groton CC to lift the visiting Rebels (12-0) over the Crusaders. Quabbin 36, Groton-Dunstable 18 — Mackenzie Ryan shot 47 at par-36 Groton CC to lead the visiting Panthers (4-5) past the Crusaders (1-7). Melrose 9, Arlington Catholic 6 — Senior goalie Anna Kleis anchored the Red Raiders (7-3-3) with 11 saves. Masconomet 11, Exeter (N.H.) 10 — Grace Fahey scored four goals for the Chieftains (10-3-1). Kathleen Gillespie added two goals and two assists. Bishop Feehan 20, Bellingham 3 — Sophomore attack Caroline Toomey netted six goals and dished out six assists to help the visiting Shamrocks (11-0-1). Central Catholic 9, Medford 5 — Ashley Masucci and Stephanie May each scored two goals for the Raiders (9-5). Lowell Catholic 20, Georgetown 5 — Lexi Petzold tallied six goals and two assists for the Fighting Crusaders. Wayland 18, Weston 9 — Junior goalie Anna Downs recorded 15 saves to lead the Warriors (10-3-1). Haverhill 15, Lowell 10 — Freshman Emily Schultz had four goals and three assists for the Hillies (5-9). Sophomore Alex Comeau made 11 saves. Sandwich 13, Plymouth North 6 — Lea Adams scored four goals for the Blue Knights (9-4). Triton 11, Hamilton-Wenham 10 — Grace Monahan and Phoebe Shaw each had two goals for Vikings. Natick 21, Braintree 8 — Junior midfielder Caroline Polymeros netted nine goals to power the 18th-ranked Red Hawks (11-3-1). Algonquin 22, Nipmuc 12 — Victoria Royo had five goals and an assist, and Juliet Chapin and Amanda Murphy each added three goals and an assist for the visiting Tomahawks (9-4). Algonquin’s Mel Wagner scored twice. Rachel Hetu’s four goals led the Warriors (4-6-1). Groton-Dunstable 24, North Middlesex 10 — Liv Rubeski had eight goals and an assist, Livy Penney had seven goals and two assists to lead the visiting Crusaders (8-5, 4-4 Midland B). Nicki Wilkinson had two goals and three assists and Olivia Aumais scored twice for Groton-Dunstable. Madison Ozog had four goals and an assist, Kimmie Zuccaro had two goals and Shalee Callahan had a goal and an assist for the Patriots (3-8, 1-6). Shrewsbury 23, Wachusett 10 — Caroline Trabucco scored seven goals, while Devan Michael and Lauren Ineson each notched five goals and two assists to lead the host Colonials (12-3, 8-1 Midland A). Shrewsbury’s Alexa Tonelli had a hat trick. Hannah Sugarman and Jen Windler each scored four goals for the Mountaineers (3-10, 0-8). Marlborough 9, Oakmont 6 — Nicolette Carter and Mackenzie Little each scored three times, with Little notching her 100th career goal, to lift the visiting Panthers (10-3). Shayla Beatty had a goal and assist for the Spartans (4-10). Northbridge 13, Hopedale 8 — Savannah Haverty scored five goals, Alyssa Murray had three and Abby LaBrie added two to boost the host Rams (6-8). Katie Rizzo had four goals for the Blue Raiders (1-9), and teammate Lucy Murphy scored twice. Littleton 10, St. Bernard’s 3 — Kelsey Doran, Alana Maher and Bridget Schofield each scored three goals for the host Tigers. Bromfield 19, Tyngsborough 10 — Soph Turchetta and Jackie Planchet each scored seven goals and Lexi Dutkewych and Meg Parlee each added two goals for the host Trojans (12-0, 8-0 Midland B). Turchetta, who also had an assist, scored all of her goals in the second half. Jackie Richardson scored four goals and Kylie O’Hare added two for the Tigers (7-7, 5-4). Austin Prep 5, Archbishop Williams 0 — Lexi Losano won her second singles match, 6-0, 6-1 for the Cougars (13-3). Cardinal Spellman 3, Brockton 2 — Kristen Boyle and Kaitlyn Hughes remain undefeated for the Cardinals. Carver 78, Norwell 58 — Senior Kevin Harkins finished first in the high jump (6 feet, 9 inches), triple jump (57.8 inches), 110-meter hurdles (16.3 seconds), and the 400-meter hurdles (59.0 seconds) to lift the Crusaders (6-2). Hamilton-Wenham 3, Triton 2 — The Generals swept the doubles and got a win at No. 1 singles from Caroline Gribbell. Reading 5, Stoneham 0 — Rockets freshman Jacquelyn Iannuzzo won her singles match set, 6-0, 6-0. Sacred Heart 3, Sturgis East 2 — Haley Ferraro won first singles, 6-1, 6-1 to lead the Saints (8-3). Quabbin 4, Fitchburg 1 — Jesse Arsenault (Q) d. Caylin Rymph, 6-1, 6-2. Xena Xiong (F) d. Emily Arsenault, 4-6, 6-4, 6-0. Nicole Patterson (Q) d. Choua Xiong, 6-4, 6-3. Meghan Erickson-Mira Lockwood (Q) d. Natalie Arsenault-Brooke Boulanger, 6-2, 6-3. Hannah Bedard-Abby Hurd (Q) d. Kacey Martin-Dasia Aldarondo, 6-1, 6-2. Records: Q 3-8 (2-5 Midland B), F 0-12 (0-8). Holy Name 4, Doherty 1 — Alana Wyatt (D) d. Maria Monje, 6-4, 7-5; Kamai Little (HN) d. Pranita Lokinendi, 6-0, 6-0; Lauren Markey (HN) d. Stephanie Guerrero, 6-1, 7-6 (7-5); Kara Breeden-Laura Yurkevicius (HN) d. Ryann Jerome-Jamie Courtney, 6-3, 6-3; Tia Trepasso-Mackenzie Hogan (HN) d. Diane Nguyen-Sudha Dhakal, 7-5, 6-1. Records: HN 6-2, D 1-7. Shepherd Hill 3, Tantasqua 2 — Nicole Cormier (T) d. Abbey Packard, 6-1, 6-0; Justyna Sudyka (SH) d. Felicia Bouchard, 6-2, 6-3; Ellen Butts (T) d. Rachael Pollier, 7-5, 6-4; Debra Chevalier-Katie Konieczny (SH) d. Elise Hanks-Witaszek-Anya Parsons, 6-1, 6-4; Victoria Crowe-Roisin Donnelly (SH) d. Avery Trifone-Emily Anadei, 6-1, 6-4. Records: SH 5-5 (5-4 SWCL), T 8-3 (7-2). Notre Dame (Worcester) 5, Bromfield 0 — Tori Oates d. Kristen Noyes, 6-1, 6-1; Julia Witt d. Rose Leikina, 6-0, 6-0; Mary Sullivan d. Ariel Jones-Mollod, 6-1, 6-2; Caroline Kelly-Hannah Mullaney d. Yonah Joffe-Allie Wei, 6-2, 6-1; Carolyn Brady-Julia Crowley d. Lisa Jorgenson-Isabelle Quinn, 2-6, 6-1, 6-1. Records: B 8-2, NDA 6-5. Leominster 3, North Middlesex 2 — Clarisse Neilan (NM) d. Madison Cormier, 0-6, 6-4, 7-6 (8-6); Casey Buckley (L) d. Melissa Dipano, 6-2, 6-0; Steph Nartey (L) d. LInda Zheng, 6-0, 6-0; Kayla Bandes-Carlee Doucet (L) d. Delaney Ledoux-Amy Flourney, 6-1, 6-3; Lynn Shattuck-Stephanie Mullin (NM) d. Taylor Skinner-Hannah Burke, 7-5, 1-6, 6-1. Records: L 7-6 (7-1 Midland B), NM 3-6 (3-5). Shrewsbury 4, Nashoba 1 — Jess Perkins (S) d. Jillian Winer, 6-2, 6-0; Kelly Poole (N) d. Ashley Kiel, 7-6, 6-1; Micaela Stowe (S) d. Emma Picaro, 7-6, 6-2; Radheka Duvvuri-Sonali Razdan (S) d. Victoria Wang-Sophia Duros, 6-1, 6-3; Celine Mende-Surbi Godbole (S) d. Kyra Fasano-Erika Rohrberg, 6-0, 6-2. Records: N 8-4 (4-4 Midland A), S 11-2 (7-2). Uxbridge 5, Worcester South 0 — Alex Van Loon d. Vivian Lam, 6-1, 6-1; Alex Jameson d. Keijs Aliko, 6-1, 7-5; Tori Luccio d. Sabrina Maliqi, 6-1, 6-4; Mary Boucher-Allie Wojnowski d. Nicole Alkes-Jenny Cao, 7-5, 6-4; Kaci Granger-Annie DuBois d. Andreana Nap-Lisa Gitau, 7-6 (9-7), 6-2. Records: S 8-2, U 4-8. Gardner 101, Clinton 40 — Multiple winners for the Wildcats (2-5) included Aly Comeau (100, 400 hurdles, pole vault, triple jump), Tsara LeBlanc (high jump, long jump, 100, 200), Shayna Yachshyn (shot put, javelin, 400) and Felicia Banda (mile, 800). Clinton is 1-4. Lunenburg 83, Bromfield 62 — Brooke Hansel won the mile (5:41.2) and the 800 (2:32.9), while Whitney Mansfield took the high jump (4-8) and the 400 hurdles (69.1) and Sophia Holman won the long jump (15-0-1/2) and the 100 hurdles (17.4) to lead the visiting Blue Knights (5-0, 4-0 Wachusett C). Amy Hunter won the 100 (13.5) and the triple jump (34-10-1/4) and Brianna Harte won the shot put (31-9-1/4) and the discus (106-0) for the host Trojans (3-3, 3-2). Millbury 106, Quaboag 30 — Brooke Nadeau won the long jump, triple jump and the 100, while Shai Anna Leao won the javelin and shot put as the Woolies (8-2) topped the Rams (3-3-1) and host Cougars. Northbridge’s Amelia Wright took the high jump and the 400 hurdles for the Rams, setting a school record in the 400 hurdles with a time of 41.9. Teammate Callie Hansson won the mile and 800. Northbridge 87, Quaboag 47 — Brooke Nadeau won the long jump, triple jump and the 100, while Shai Anna Leao won the javelin and shot put as the Woolies (8-2) topped the Rams (3-3-1) and host Cougars. Northbridge’s Amelia Wright took the high jump and the 400 hurdles for the Rams, setting a school record in the 400 hurdles with a time of 41.9. Teammate Callie Hansson won the mile and 800. Millbury 82, Northbridge 54 — Brooke Nadeau won the long jump, triple jump and the 100, while Shai Anna Leao won the javelin and shot put as the Woolies (8-2) topped the Rams (3-3-1) and host Cougars. Northbridge’s Amelia Wright took the high jump and the 400 hurdles for the Rams, setting a school record in the 400 hurdles with a time of 41.9. Teammate Callie Hansson won the mile and 800. Blackstone Valley 88, Monty Tech 48 — Francesca Niro won the 200 meters and long jump to lift the host Beavers (4-1). Haley Martin (shot put, discus) and Maria Macias (high jump, triple jump) were double winners for the Bulldogs. Keefe Tech 71, Worcester Tech 69 — Senior Karina Gonzalez won the 100, long jump and javelin to propel the visiting Broncos (1-1, 1-1 CAL) to victory. Junior Kelsie Rushlow of the Eagles (5-3, 3-2) shattered her own school record by more than five feet in winning the discus with a throw of 79 feet, 7 inches.